Ok so this is going to be another of my 'regular' topics. A hair history on someone famous, charting their hair journey, the good, the bad, and even the ugly! 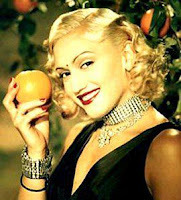 To start this off, a lady most of us know, Gwen Stefani. Gwen went for long and sleek in 2001, I personally think her face is too small for this amount of hair, it swamps her. The parting is still on the side and the front of the hair hasn't changed too much over the years. Along with the trademark Red lipstick and perfect abs. The long hair was still there, but scraped back into a ponytail. She reworked the quiff in 2006, adding a 40's element. I think this is a beautiful look for her, showing off her features perfectly. One fail safe style shown overtime has always been 40's styling, pin curls, finger waves & loose barrel curls, often pinned away from the face. These came back into favour with Gwen around 2006/7 after a short dalliance with a heavy fringe to promote her solo album 'Love. Angel. Music. Baby'. Which whilst suiting her didn't stay for long and the side fringe returned. Most upto date picture of Gwen is her appearance at NY Fashion week. And how amazing does her hair look. She's toyed with curls on and off through the years but I think she's got it right this time. Great length and amazing volume. Any celebs you'd like to see, past hair and present? And do you think Gwen has reached her hair peak? What a great post, Kel! The 40's waves look so good on her but I did think those little plaits she wore on "Don't Speak" were super-cute. Lets see some Madonna next - she's completely transformed her look over the years! Love Gwen's hair/style. Definately think she rocks the Quiff the best! I think Madonna or Victoria Beckham should be next - looking forward to it! Great post Kel, can't wait to see the next in the series. I love Gwen's hair in the last photo but the 40's style quiff is just fabulous. Can't think of many people who could carry it off as well as she does. Drew Barrymore maybe? She's changed styles and colours a fair amount. She's a girl who knows her style, right? Great feature! she's definitely one of the best people who can rock platinum blonde!